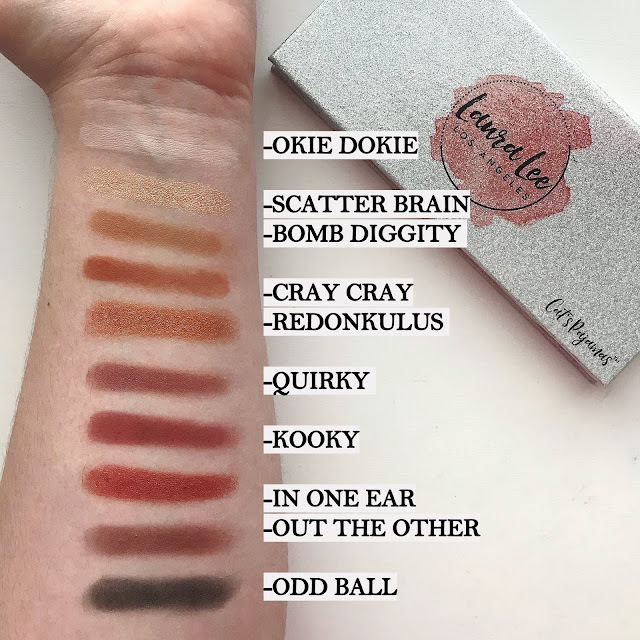 Laura Lee is a well known Youtuber who recently came out with an eyeshadow palette called Nudie Patootie (You can read my review on it here!). When I bought the Nudie Patootie palette, I also picked up Laura Lee’s first palette, Cat’s Pajamas. I have seen that there has been a few mixed reviews about this palette from what I have read, so I was so excited to form my own opinion on it which ended up being completely different compared to opinions that I have read. I also love Laura Lee and have been a huge fan, so I’m excited for her products. The packaging of the palette is very cute, I love the floral inside and the glittery cover. I also love the fact that the glitter is not real glitter so it won’t get everywhere or on everything. This palette does have 10 shades and retails for $40. I do agree with others and think that the price is kind of high since there are only 10 shades. Laura Lee’s most recent palette has 14 shades for $45 so that palette does include 4 more shades for only five more dollars. The shades are all very pigmented and gorgeous. I love every single shade in this palette. Most of the shades are red and mauve colors. This palette overall is very light and perfect for the spring and summer time but some of the shades would also be perfect for darker fall looks. I have seen reviews on people not liking the formula of the shades, but I have to disagree. I love the formula. It is not a creamy texture, but I think it is perfect for the brushes I use to pick up the shade. This is a personal preference because I do not like creamer shades, I just feel they’re harder to apply with brushes and I need to use my finger to apply them. These shades are not creamy and blend very nicely and apply very well. Overall, I think the only complaint I have would be the price of the palette for the amount of shades. That would be the only thing that would hold me back from buying especially when there are other palettes that contain possibly similar shades for the same price, but include a more amount of shades. Other than that, the quality is very good and I would encourage anyone to buy this palette.